Grows up to 3m in height, taller than most other Barberies. 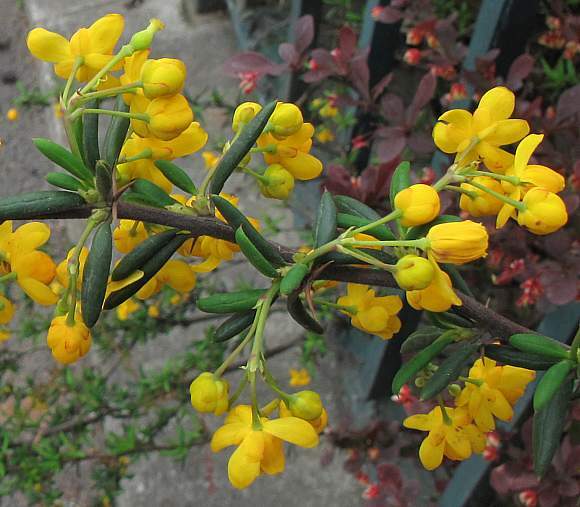 Flowers a deeper yellow than most other Barberries apart from the orange-yellow of Darwin's Barberry. 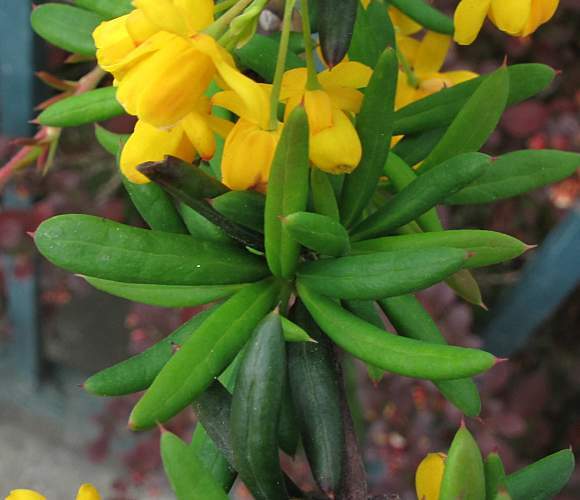 Golden yellow flowers in a loose fascicle or short raceme. Leaves matt, older ones scarcely glossy. 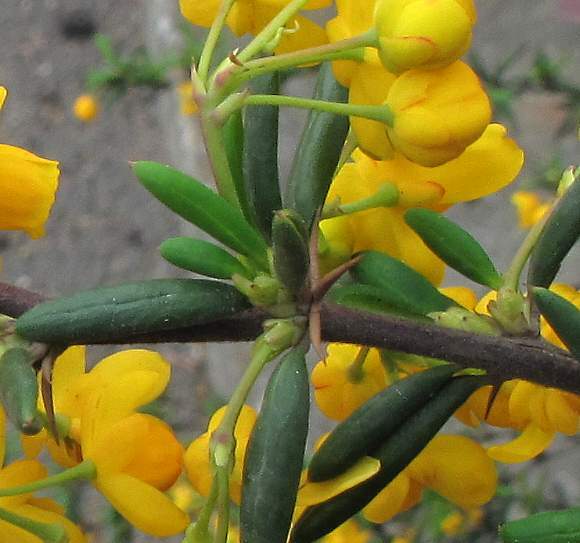 Flowers may have slightly longer and straighter petals than other Barberries. Both the 5 sepals and the 5 petals are concolorous. 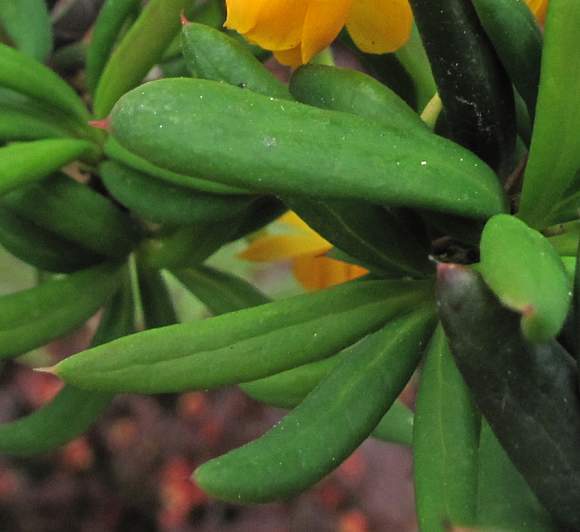 Leaves very narrow in relation to length, almost like those of Yew but of lighter hue. 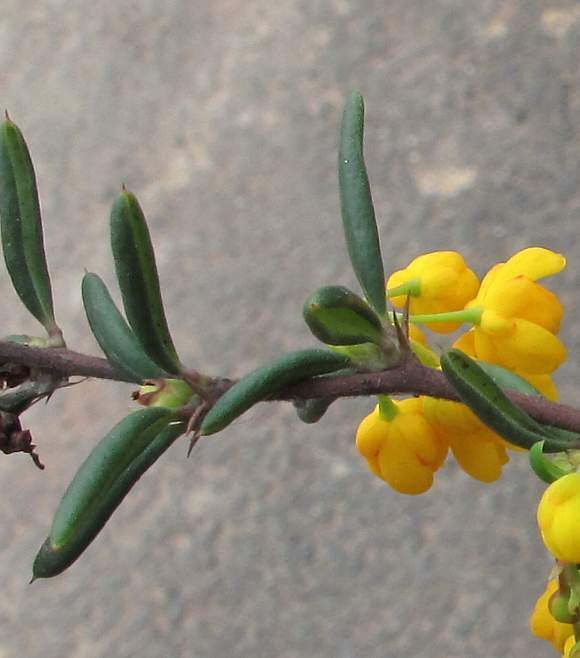 They have an in-rolled margin (revolute - not dis-similar to those of Bog Rosemary) and lack any sort of teeth (entire), but they do have a short spicule at the tip. 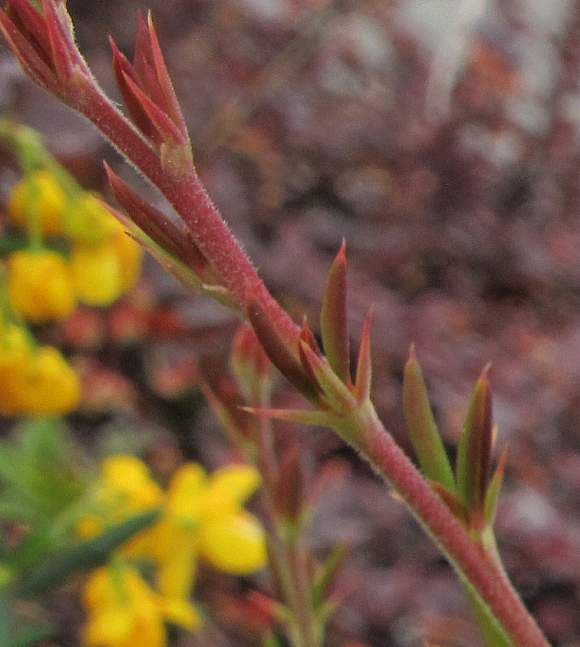 The short spinose tips of the leaves. Twig spines mostly 3-partite and not as long as those of Barberry. Some spines are only 2-partite, or even single. Is the Hybrid between : Darwin's Barberry (Berberis darwinii) and a Barberry that does not grow wild in the UK variously called Crow Barberry or Golden Barberry (Berberis empetrifolia) which has flowers with an even deeper shade of yellow bordering on orange, but the same blue-black coloured berries and similarly very narrow leaves. 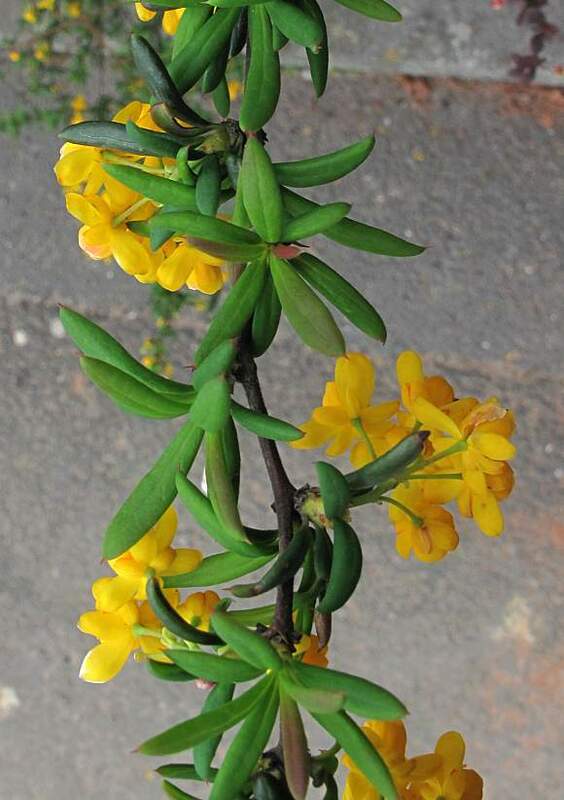 This is a hybrid and mainly a garden plant planted for hedges in the UK and which can escape, although you are much more likely to find it in a garden or as hedging by roads or other municipal areas. 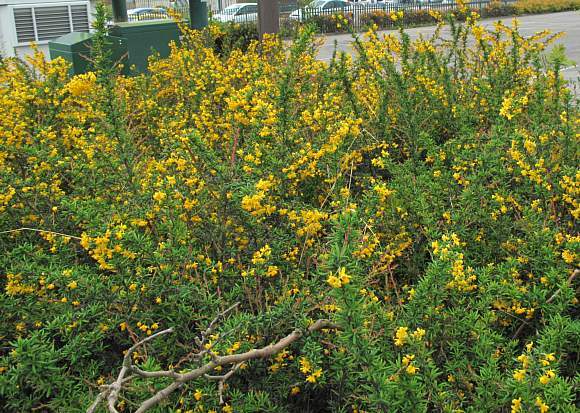 Distinguishing Feature : The Barberry with the narrowest leaves extant in the UK. 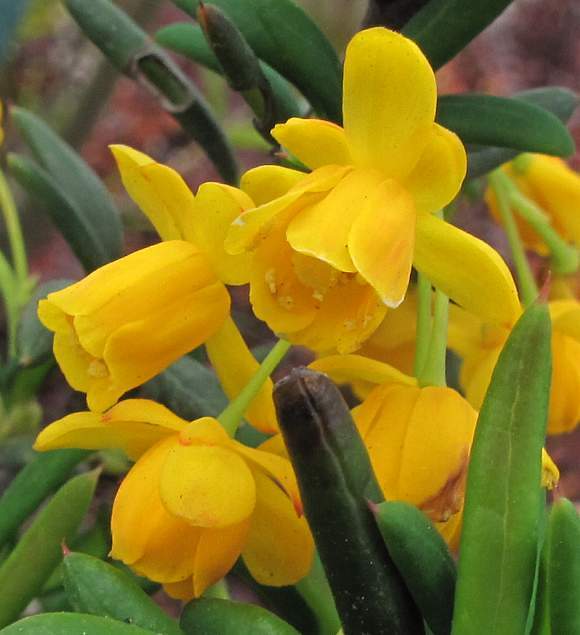 A yellow dye can be extracted from the roots and bark. 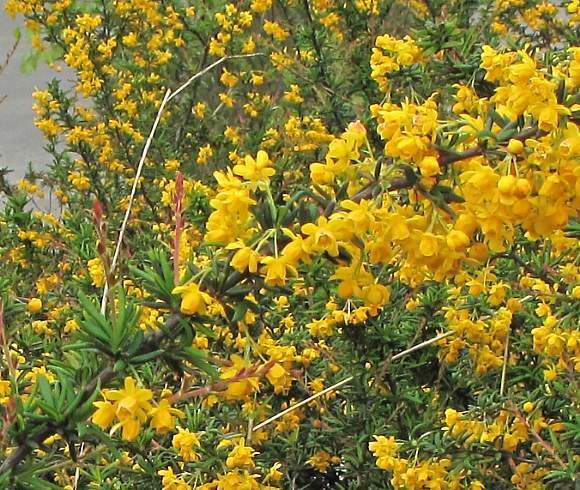 See Barberry.